All the wonderful semi-custom features you want, including door styles for any decor. Solid wood doors in five species, beautifully finished with their exclusive Craft-Guard process. Satin-finished thermofoil and attractive Craft-Guar painted doors. Aspen wood dovetail drawers with under mount full-extension sides are available at no charge. 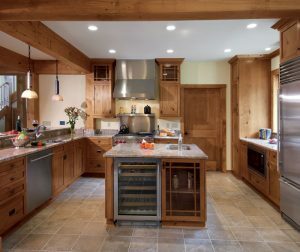 When you need your kitchen back, fast, a per-fabricated kitchen is the way to. With so many different options, you can have a custom look in 6 – 8 weeks from the time of ordering. With Highland, we work with you every step of the way, from the layout of your new kitchen to the various features that can be added to help your kitchen reflex you! It can all be laid out on our 20/20 Kitchen Design computer program and reviewed in 3D. Rather you are replacing a portion of your existing kitchen or the entire thing, sometimes cabinets must be customized to fit or match. Highland is able to work with you to match everything perfectly.